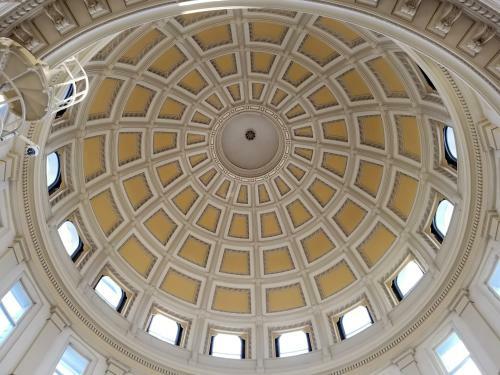 There is much to dazzle the eyes in the Colorado State Capitol — intricate stained glass, towering columns, gilded crown molding, gleaming brass chandeliers and, of course, the gold dome atop it all. Surprisingly, one of the building’s most striking features is one you can walk right up to and touch. From the moment you enter the capitol building, you’ll notice a pinkish, marble-like stone that comprises the tall wainscoting and column plinths. The rich rose, blush and crimson hues are not unlike that of late-summer Colorado sunset. And if you look long enough at the rock’s swirling veins, you’ll begin to see shapes, designs and figures in the grain — here a woman’s profile, there a rippling pond, here a mountainous landscape. What is this unusual material? It’s no exaggeration to say it is one of the rarest stones in the world. Once called Beulah red marble, the stone is actually not marble, but rather is metamorphosed limestone tinged with iron oxide. Also referred to as Colorado rose onyx, the stone was discovered in a small deposit in the town of Beulah (near Pueblo, Colo.) in 1893. The Beulah quarry remains the only known source of the stone in the world. 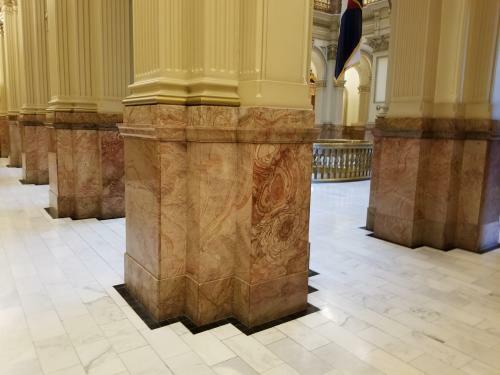 In fact, the adornment of the Colorado State Capitol’s interior depleted the entire known supply of rose onyx. Tour guide Aaron Fennimore notes that a reserve supply of the quarried rose onyx is kept in the capitol’s underground vaults but is rarely used. “Twice I’ve seen the rose onyx break, but the restoration team was so skilled in repairing it that you would never even know the damage was there,” he says. The floors of the capitol are tiled in white Yule marble, the state rock of Colorado. The stone was quarried in Marble, Colo. “It is one of the purest and densest marbles in the world,” Fennimore says. Yule marble was later used for the exterior of the Lincoln Memorial and the Tomb of the Unknowns in Washington, D.C.
Don’t miss the “Women’s Gold” quilt, a tribute to some of Colorado’s most remarkable women, including freed slave and entrepreneur Clara Brown, Pulitzer Prize-winning playwright Mary Chase and the first canonized American saint, Mother Cabrini. Have your picture taken by the “One Mile Above Sea Level” marker on the exterior steps of the capitol. And be sure to take the tour to find out why there are actually three mile-high markers. Admire the restored House of Representatives chamber, which was recently painstakingly restored to its original glory after having been pasted over with acoustic tiling in the 1950s. See the detailed, stained-glass portrait of Emily Griffith, a teacher who devoted her life to helping immigrants and the impoverished gain access to free education. She founded the Emily Griffith Opportunity School, which still operates today. To date, it has served 2.5 million students. Glimpse the beautiful Ethnic Heritage windows in the Old Supreme Court Chamber, a reminder of the diverse populations — Hispanic, Native American, African-American, Chinese and Japanese communities — that have helped shape Colorado. Looking for more? The State of Colorado website has a terrific, floor-by-floor guide to the artwork inside the capitol. Free public tours are offered on the hour, Mon.–Fri., 10 a.m.–3 p.m. Arrive 20 minutes in advance of your tour, as tours do fill up.